Piers began his career with the good fortune of obtaining a 6 year apprenticeship with the London and New York company of silver dealers, S J Shrubsole. At the same time, he studied at the Sir John Cass School of Art and in 1979, received a City & Guild London Institute Diploma in Silversmith work and Allied Crafts. 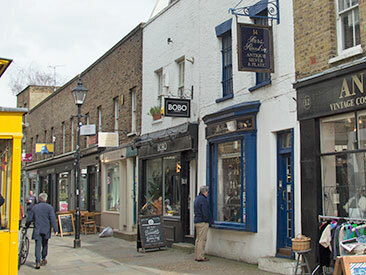 Weekends and holidays were spent working his own market stall in Camden Passage, Islington which is famed for its antique trade and where he opened his first tiny, one room shop in the Mall Antique Arcade, staying there for almost ten years. 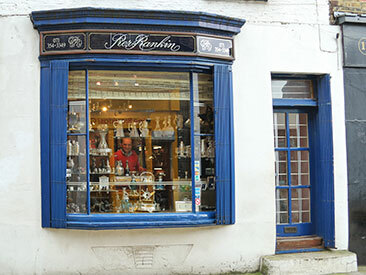 In 1994 he moved 500 yards further along the Passage and now has the luxury of a three floor shop, two of which are filled with high quality English silver (occasionally some foreign), Silver plate, Old Sheffield plate and Glassware. His main business is export, selling to other dealers all over the world including some of America’s most prestigious stores, but being open six days a week also allows retail sales to the public.Piers is looking forward to hearing from you and if you have any questions please don't hesitate to get in touch. 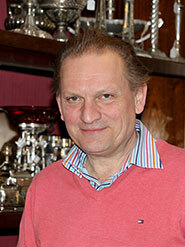 Piers Rankin Antiques is in the traffic free Camden Passage, Islington, London. Nearest Underground Station is 'Angel' on the Northern Line. Nearest mainline railway stations are Kings Cross and St Pancras International which are around 10 minutes away by taxi or bus. You can catch Eurostar trains to and from Europe at St Pancras International.